Even men in the Stone Age had some style! The Caveman Halloween Wig features a rugged, messy and nappy hair wig with decorative animal print fur placed upon the pouch, with brown feathers and animal fur hanging off of it. A wig like this one will assist in your fitting in with the rest of the Stone Age crew. The opportunity is yours to have the nicest hair out of all the Stone Age men, so why would you pass up this chance?! 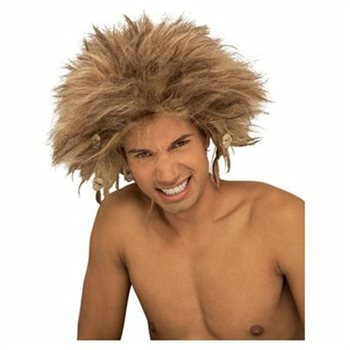 Wearing the Mens Caveman Halloween Wig will add more charm to any of your Stone Age or Caveman costume creations. Grab your club and show off the Mens Caveman Halloween Wig you're fashioning. The others will be in awe!